Bo Rong's badminton career found a new lease after she arrived in the U.S., where the level of competition isn't nearly as strong as in her homeland of China. She's hoping to earn U.S. citizenship in time to compete in Rio. When Bo Rong travels, strangers tend to spot the racket-shaped bag slung over her shoulder and ask excitedly, "Oh, you're a tennis player?" "No, no," Bo tells them. "It's a badminton racket." That response often produces puzzled looks, at which point Bo, the reigning U.S. women's singles badminton champion, patiently offers a primer on the game. She can't help smiling at the irony, because where Bo comes from, badminton needs about as much description as basketball does in the States. ("OK, so you put this round ball through a hoop ...") That is to say, in China, badminton needs no explanation. 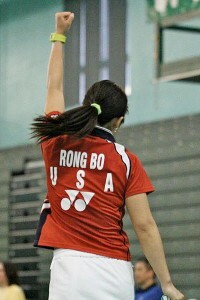 Bo Rong began playing badminton at age 8 and has continued her career in the United States. Bo grew up in Beijing, where most people would be thrilled to meet a national team member. "In China, everybody plays badminton at some point," Bo said. "But here in the U.S., there is no badminton at university, so most kids don't continue playing after high school, if they play at all." Although Bo is recovering from microfracture surgery on her right knee, she expects to be in top form by next spring. While her best wasn't quite good enough to secure her a cherished spot on the Chinese Olympic team, she is still a rare talent in the U.S., one of only a handful of women with a serious chance to qualify for the 2016 Summer Games in Rio de Janeiro. "Bo probably would have been pushed into retirement in China, but being able to continue her career in the U.S. seems to have given her a whole new lease on the game," said Fred Coleman, chairman of the USA Badminton board of directors. "And the young players here who watch her will see a whole new level of skill." Fittingly, it was Bo's dedication to badminton that helped her find love off the court. Schafer, 27, started playing the game for fun as an undergraduate student at the University of Wisconsin, where he originally hoped to find a pingpong club and ended up discovering a badminton community populated by international students. After earning his degree in 2008, he decided to take a year off to travel abroad. When a friend told him about a badminton academy in Denmark, Schafer made that his first stop. Bo, who was playing in Denmark's highly competitive SuperLeague, happened to be training at the same academy, and the two players quickly hit it off, with Schafer eventually following Bo to Beijing. The couple settled in the U.S. three years ago and now live in Houston, where Nick is working on a Ph.D. in biophysics at Rice University. "I grew up playing basketball and baseball, the traditional U.S. sports," Schafer said. "I barely knew what badminton was until I went to college. What I like about the game is that it's a unique mix of speed, strength and strategy, really dynamic." Bo's father introduced her to the game, and by age 8 she was spending a large chunk of each week learning and training at the national team academy in Beijing. There is little schedule flexibility in China, Bo explained, but all expenses are taken care of by the government and clubs. In the U.S., the opposite holds true. As Bo prepares for Olympic qualifying, she must weigh the cost of travel and training with the importance of each tournament. She is also responsible for finding her own sponsors. "You have the freedom and flexibility to play whatever tournaments you want," Bo said. "But the flip side is that you have to fund yourself and be your own manager, so it's difficult in that respect." Of course, new challenges also bring new rewards. Last year, Bo coached at a club in San Francisco and was impressed by some of her younger students. "Kids here are actually really good," she said. "And I think in 10 years, badminton will be better in the U.S. than it is now." In the meantime, she will happily explain the game to anyone who asks.